Produces a maximum output of 5.5kw / 5500. Powered by an easy start 389cc 4-stroke Hyundai petrol engine. Fitted with 2x 115v 16a & 1x 230v 32a sockets to end facing control panel. Complete with wheel kit and robust steel frame. Can be converted to run off LPG for use as a dual fuel generator. 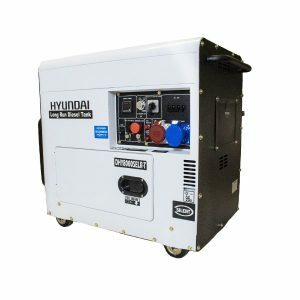 The HY7000LEK-2 is a powerful yet easily portable 5.5kW / 6.8kVa* open frame generator from Hyundai. Designed for both home and commercial use the HY7000LEK-2 is powered by a 389cc / 13hp economical single cylinder Hyundai 4-Stroke engine. Weighing only 86kg, the HY7000LEK-2 is easy to maneuver due to its included wheel kit, rugged open frame and folding handles. The Hyundai AVR alternator keeps the voltage output smooth, within +/- 3% of 230V. This means it can be used to power sensitive equipment such as computers, laptops and charge mobile phones. However, the AVR alternator is also rugged enough to handle the harsh demands of power tools and building site equipment. The HY7000LEK-2 is an all round workhorse. Using the latest low noise engine technology, the HY7000LEK-2 produces only 65 dBA @ 7m. The on board digital display meter displays hours run, the output voltage and frequency. By making it easy to know when a service on the machine is due, you can be confident that you will get thousands of hours use and do not cause harm to the unit by missing a service. Suitable for industrial and home use the HY7000LEK-2 is a highly versatile open frame generator ideal for powering power tools, lighting rigs, garages, workshops or sensitive home equipment such as laptops, sound systems, TV’s….etc. With low service and maintenance requirements, the HY7000LEK-2 is incredibly user-friendly, and has full Hyundai UK parts back up.